My Bolster Cushion for Rowan and a ‘Knitted’ Painting! Just before Christmas I was busily working on a design for Rowan using their new yarn, Pure Wool Worsted …….which many of you are waiting to use for the Martin Storey knit a long (details still to come in the next week or so). The remit, which was given to me and my fellow Rowan Ambassadors, was to design a home-ware accessory using a maximum of 3 balls of yarn. After submitting my design, Wheel Barrel, I’m proud to say that it was accepted and published by Rowan Yarns along with the other Ambassadors designs in the Pure Wool Worsted Home Décor Online Collection. This collection is a free download for all Rowan Subscribers and Rowan Members. (See links below). Wheel Barrel, shown below, is a bolster style cushion using 3 balls of Rowan Pure Wool Worsted, a wonderful soft machine washable yarn which is available in fifty different shades. I used Ivory (101), Umber (110) and Cardinal (136). The cushion cover is knitted in the round using a textured stitch and is finished with a button closure at each end. 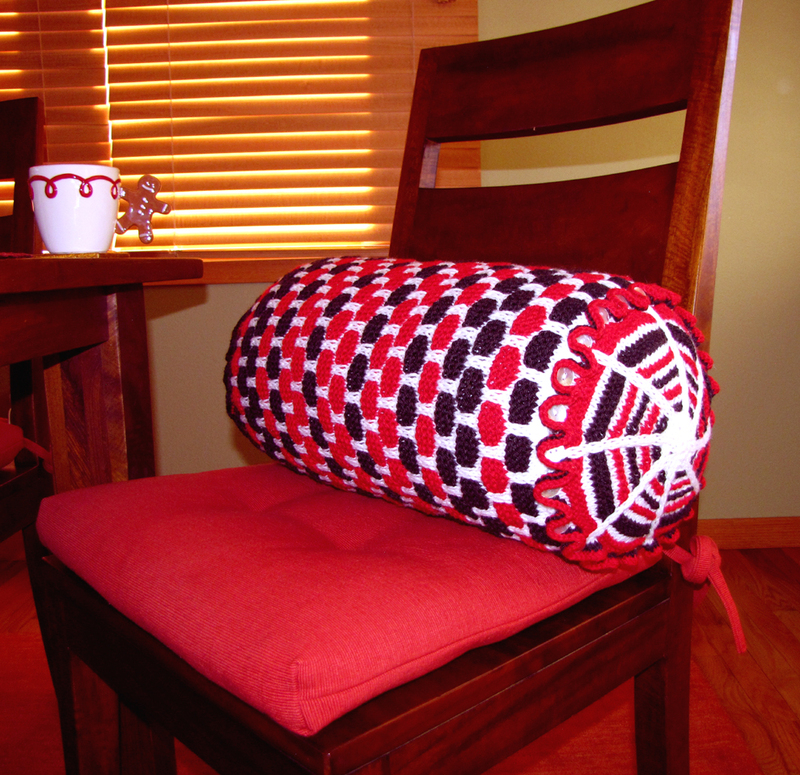 My pattern also includes instructions on how to make the cushion pad. 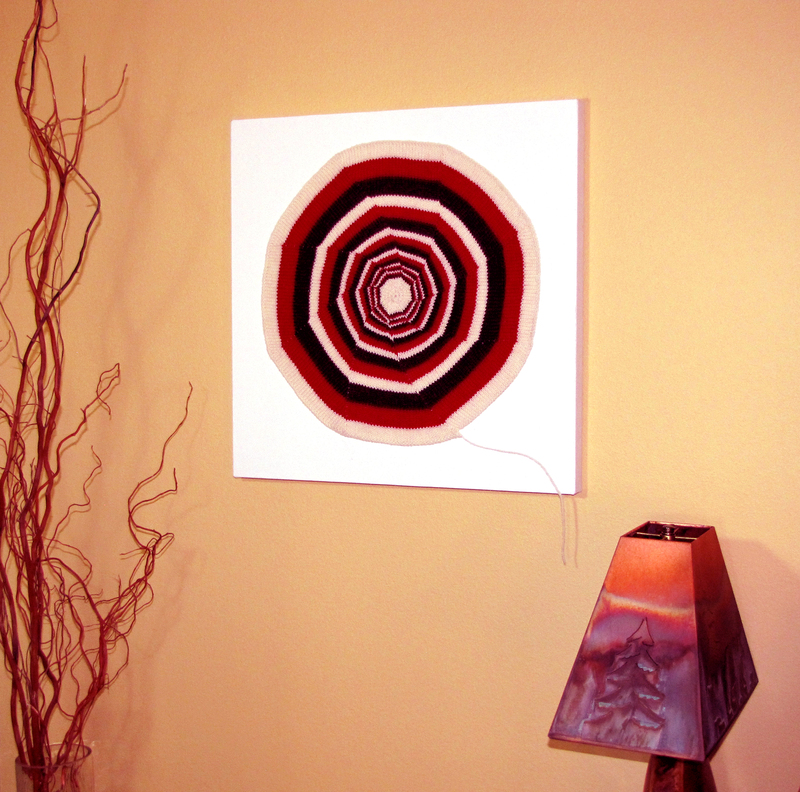 I have also designed another home-ware item using Rowan Pure Wool Worsted: a ‘knitted’ painting called Fibonacci Octad shown below. 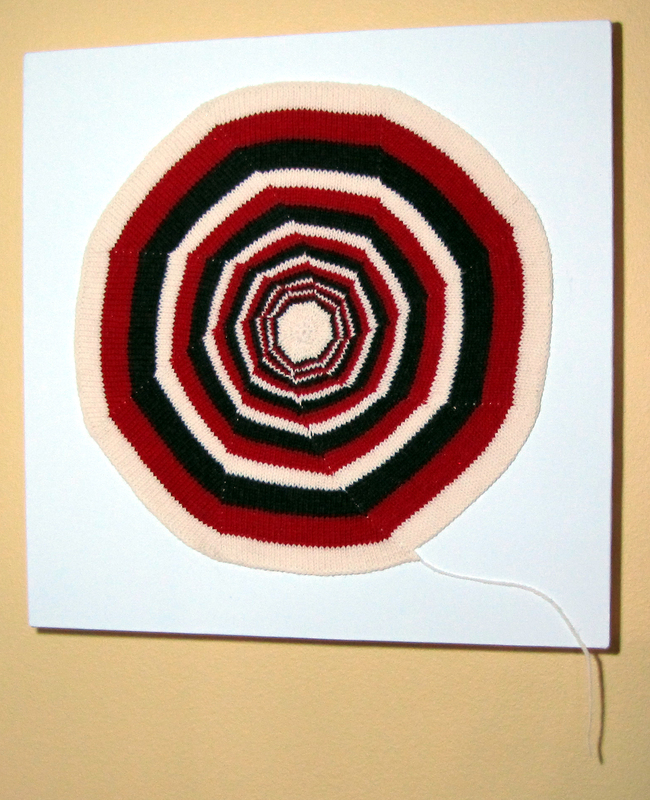 The pattern for the knitted wall art is available on Ravelry along with my other designs. To leave a comment click on Leave a reply link found below at the bottom of this post or click here, and when the new page opens scroll to the bottom of the page to the ‘Leave a Reply’ box.